Trump’s latest budget proposal would make American families both sicker and hungrier. His 2020 budget attacks critical health care, nutrition, and affordable housing programs that millions of Americans rely on, including $845 billion in Medicare cuts and $777 billion in cuts to Medicaid and the Affordable Care Act. Once again, Trump is proving that his promises mean nothing. Help get the word out by sharing this graphic on Twitter. $220 billion in cuts to SNAP, a nutrition assistance program that helps 38 million people in 19 million households put food on the table every month. Trump’s budget would also mandate work requirements for SNAP and end cash benefits for low-income families. $3.5 billion in cuts to WIC, a program that provides nutrition assistance to more than 6 million infants, toddlers, and pregnant mothers. $207 billion in cuts to student loans, making college even less affordable than it already is. $4.7 billion in cuts to affordable housing programs in 2020 alone. Trump’s budget directly targets working families, all while his $2 trillion tax scam continues to fill the pockets of his donors and corporate cronies. 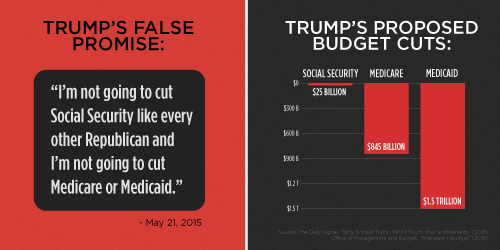 Share this graphic on Facebook and Twitter to hold Trump accountable for his lies.